Macron, who spent the past week touring former battlefields of eastern and northern France, was to meet May at the Thiepval Memorial to the Missing of the Somme, near the Belgian border. The memorial commemorates 72,337 missing British and South African servicemen who died between 1915 and 1918 in a series of battles along the Somme river, and who have no known grave. 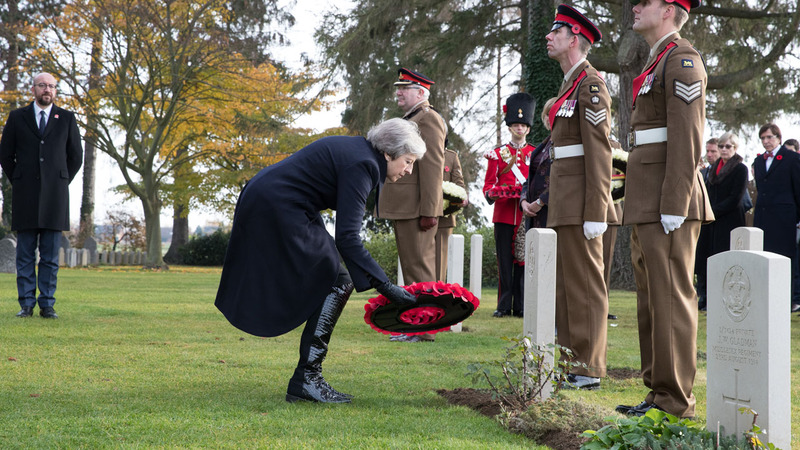 May started the day with a visit to the Saint Symphorien Military Cemetery in Mons, Belgium, where she and Belgian Prime Minister Charles Michel laid a wreath at the graves of the first and last soldiers killed on the Western Front. Following a reception with British and Belgian armed forces members in Mons, May met Macron in Albert, a town in the heart of the Somme region which suffered significant bombardment during the First World War. They were to hold a working lunch where Brexit is expected to be at the top of the agenda, before laying a wreath at the Thiepval Memorial. The wreath, made for the occasion, will combine poppies and cornflowers, the respective emblems of remembrance for Britain and France. France has taken a hard line in the Brexit negotiations, with Macron insistent that Britain should not be allowed to negotiate advantages for itself as it withdraws from the European Union. Negotiators have been racing against the clock to try to agree on the outlines of an agreement to settle Britain’s exit that could be approved at an EU summit this month. Macron will then travel to Rethondes, the clearing in the Compiegne forest where the WWI armistice was signed, for a meeting with German Chancellor Angela Merkel. The meeting in a forest clearing will be highly symbolic of reconciliation between France and Germany, as Rethondes was also the site imposed by Nazi Germany on the French when accepting their surrender in 1940, the Elysee said. On Sunday morning Macron will host dozens of world leaders, including Russia’s Vladimir Putin, at the Arc de Triomphe in Paris for a remembrance ceremony at the tomb of the Unknown Soldier, 100 years to the day after the war ended. Macron, who would like the peace forum to become an annual event on the lines of the Davos economic forum, and Merkel — the first to speak at the event — will underline the importance of multilateralism in the search for peace. It comes at a time when the United States has disrupted the Western order by taking a more unilateral stance in international affairs — Trump is not expected to attend the forum. But even as Macron takes the international stage, he has been dogged with domestic criticism during his tour of WWI sites this week. At several stops he has been accosted by people complaining about high fuel costs and other grievances, and also stirred controversy by suggesting that Vichy leader Philippe Petain deserved to be included in celebrations honouring WWI military chiefs.